In defending one’s network against cyber attacks, certain vulnerabilities may seem acceptable risks when considered in isolation. But an intruder can often infiltrate a seemingly well-guarded network through a multi-step intrusion, in which each step prepares for the next. Attack graphs can reveal the threat by enumerating possible sequences of exploits that can be followed to compromise given critical resources. However, attack graphs do not directly provide a solution to remove the threat. Finding a solution by hand is error-prone and tedious, particularly for larger and less secure networks whose attack graphs are overly complicated. 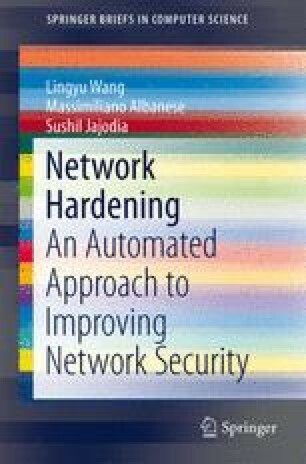 In this chapter, we propose a solution to automate the task of hardening a network against multi-step intrusions. More specifically, we first represent given critical resources as a logic proposition of initial conditions. We then simplify the proposition to make hardening options explicit. Among the options we finally choose solutions with the minimum cost.